I am about to buy a new Macbook Pro 15'. This is my only computer as I travel a lot and carry my work everywhere. I am a lighting designer and therefore render 3D set models with lighting. I can afford to boost my expensive new toy only with one feature. CPU, RAM or Graphic card. Which on will speed my render the most? 1- Going from Intel hexacore i7 2.6 Ghz to Intel hexacore i9 2.9 Ghz? 2- Going from 16 Go of RAM to 32 Go of RAM? 3- Going from Radeon Pro 560x 4Go GDDR5 to Radeon Pro Vega 20 4Go HBM2? is given by the small body and so same for both. The i9 will help only for short burst loads. when you have less RAM than you need. 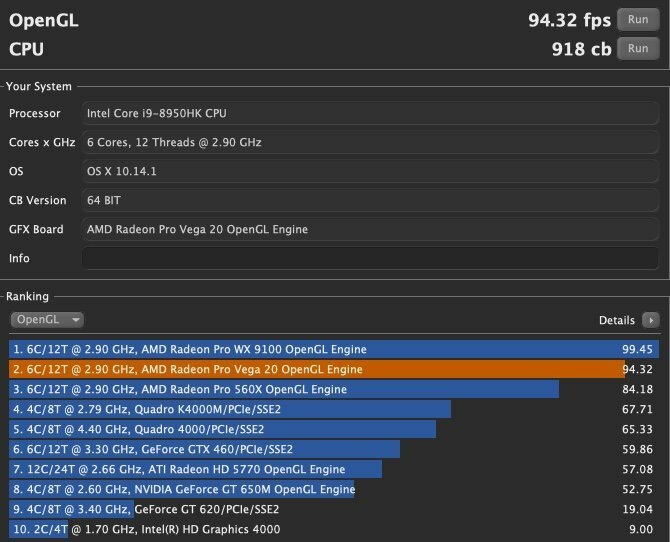 Seems like the Vega is really faster and worth its money. Pity it has also only 4 GB VRAM, which isn't that much today. I generally find that making the processor bump isn't worth he investment, that bump is generally costs more than it is worth. RAM, I like RAM, but I haven't investigated the new video cards. Looking at the same MacBook Pro for my business. The Vega 20 GPU has improved thermals over the previous 560X GPU. See this review. Has a Cine Bench score of over 1100 so its twice as fast as my existing desk monster. This is not a CAD review but does cover Cine Bench scores. The only issue is is expensive machine to cart around. Get a heavy duty backpack. 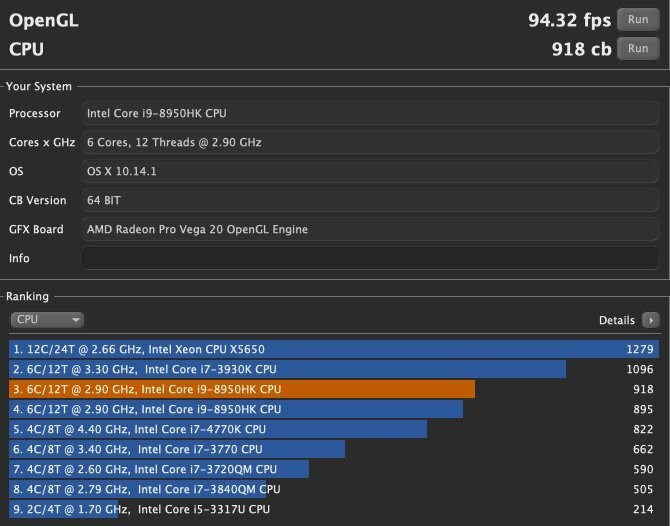 Here are my benchmarks. I recently returned my MacBook Pro with the Radeon 560 GPU. I now have the same machine, but with the Vega 20 GPU. You will see I have better performance both in CPU and Open GL. The CPU & GPU numbers below the highlighted ones are my old benchmarks. as I have only 99ish for my desktop RTX 2070. That is what I got on my WX 9100 before the new laptop. Now I am getting around 95. Very strange. Not strange - that is good ! I heard from everywhere that the new Vega in MBP is good. to compare GPU Hardware power itself. but CPU Power Consumption and Temperatures stay reasonably low. Far below any artificial CPU Stress Benchmarks. But Cinebench CPU is still a very trusty Benchmark for CPU Render Speed. fast for my CPU Renderings. No matter if Rendering in C4D or Modo. And it could be that similar is true for the Cinebench OpenGL Test. may be a typical load from a typical 3D App Viewport. because you replace your old GTX 1060 with a RTX 2080Ti. awake your RTX AI and RT cores from sleep and finally start the Fans. Thanks everyone for all your comments and tips. It is very interesting but I must admit I am somewhat more confused today. I thought I would get a simple and unanimous response such as :"Go for the Graphic card!" or whatever. It seems that it is more complex although I don't really see why it should be knowing my quest is only in regards to using VW with the main purpose of rendering 3D stage design with lights. At the moment, I feel that there cannot be a single choice and one should upgrade everything to get a clear vote. I wish it was that easy financially for me. Perhaps we should turn to VW engineers who exactly know what hardware is most useful to boost their 3D engine. But again, thank you all for the time you have taken looking at this issue. If I may add and ask, could you all finish your post by a simple line: If I had to choose, I would upgrade RAM or CPU or GPU so it is clear for the less computer technologie oriented fellows? Is anyone running Vectorworks 2019 on a new 2018 13” MacBook Pro? I have a 2016 13” MBP that ran Vectorworks just fine until I upgraded to Mojave. Now it’s unusable. I’m thinking about upgrading before the end of the year. I like the 13” MBP for portability and it works great for light drawing and modeling. The 15” MBP has a better GPU, but I’d rather not lug that around if possible.